Bad Cat has unleashed another beast in the Classic Pro Reverb. Very little noise - ideal for the studio as well as the stage. As one of the original and most respected names in the so-called ‘boutique’ market, California-based Bad Cat Amplification produces point-to-point hand-wired designs that blend vintage valve know-how with exceptional build quality. This comes at a price, of course, and in the past Bad Cats were exclusively for those well-heeled enough not to need to ask “how much?”. 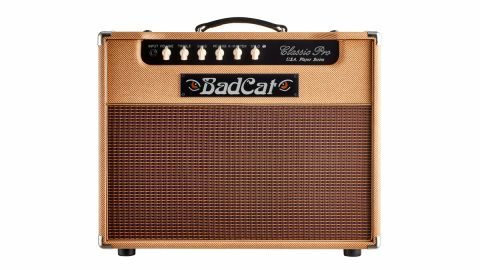 However, things changed for the better when Bad Cat introduced its USA Player range, which uses high-quality PCB construction to make substantial savings on build time, while managing to retain the all-important sound and response by using the same transformers and British-made Celestion loudspeakers as its more expensive counterparts. The USA Player range has been a big success for Bad Cat, and here we’re looking at the latest addition, the Classic Pro Reverb combo. Like all Bad Cats, the Classic Pro comes housed in a perfectly made Baltic birch ply cabinet. The 1x12 enclosure is slightly oversized to help bass response, and the usual Bad Cat attention to detail is everywhere. The tweed covering on this sample has no visible cuts, even in the tight radiuses under the control panel, which takes real skill. The tough ventilated aluminium chassis supports a pair of Bad Cat’s exclusive paper bobbin handwound transformers. Inside, the electronics are all supported on one large high-quality PCB, including the Classic Pro’s digital reverb chip, the front and rear panel components and the valve bases. This is where the cost saving is made, and yet the components are no different to those on a point-to-point Bad Cat and the board paths are big enough and thick enough to avoid signal degradation. One benefit of using PCBs is consistency, which is especially important in a high-impedance valve-powered circuit. Where each point-to-point amp in a production run will need careful attention to component and wire positioning, once a board is working to expectations, every copy of that board will be identical. The Classic Pro Reverb is very quiet in operation, with minimal hiss and hum. This is a medium-gain circuit that sounds best when driven hard to develop overdrive in the power stage as well as the preamp, and to that end, the Classic Pro has two of Bad Cat’s special K Master master volume controls, one for rhythm and one for solo, which can be toggled using the single-button footswitch that comes with the amp. The K Master is a special circuit that works like a separate gain stage sat between phase splitter and power valves, which can drive the power amp independently of the preamp, allowing full use of the gain control for clean and driven sounds, extending clean headroom and improving dynamics at low volume. Driven at the levels it’s intended for, the Classic Pro produces sweet yet punchy clean tones, with a toothsome tweed-inspired bite from the 6V6s when the gain control is wound up. The digital reverb is excellent, adding a smooth halo to notes without any splashiness. The switchable dual master volume idea works well in practice. It does exactly what it says on the tin, effectively extending the Classic Pro’s range and making it sound much bigger than 20 watts. We tried the Classic Pro out with a selection of guitars and, while it sounded great with them all, we felt the best results came from our PAF-equipped Les Paul. The hotter output and bright top-end bite fit the Classic Pro’s tone perfectly, with plenty of sustain from the slightly higher output pickups. Played with lower gain and cleaner tones, the Classic Pro also sounds great with pedals, thanks to its series effects loop. The PCB doesn’t get in the way of that special Bad Cat sound and the rest of the amp is built to the same standard as top-of-the-range hand-wired models. While this one sounds good with pedals, it’s very special when wound up, so it’s an ideal amp for purist players who like to control everything from the guitar. While it isn’t cheap, it’s relatively accessible compared with hand-wired Bad Cat models, so here’s a chance to own that legendary illuminated badge and all the great tone that comes with it.